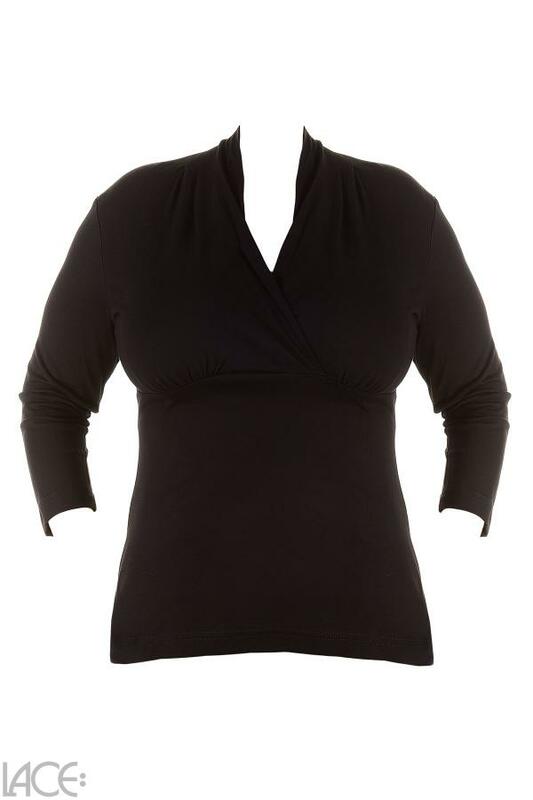 Black shirt from Tencel® Lyocell. A refined and elegant basic top - the Aurora is a super-soft shirt wearable for any day, and you will always feel good. It has a shapely draped chest and neckline, which shows your curvaceous figure. The v-neck is feminine, but narrow and does not feel exposing. The suggested scarf collar drapes into elegant folds which play around the décolleté. As with all maximila styles, the underbust seam is set a bit lower, so the shirt also fits women with bigger breasts perfectly. The fine Tencel® fabric ensures an optimal fit and maximum comfort. Aurora can be combined in a variety of ways and has become the absolute favourite piece! Tencel fibres are produced from the natural substance cellulose. They have a very smooth fibre structure - the resulting garments are gentle to the skin like silk. Despite this fineness, Tencel® has a high resistance and is very stable. Infinitely fine, with a smooth surface and outstanding four-way stretch, this material is particularly stable, but above all, it provides for a luxurious, soft wearing feeling. Lyocell is the generic fibre name and is offered by Lenzing AG under the brand name Tencel®. Confidence starts from the inside out - and your body confidence starts with your lingerie or swimwear. Maximila Aurora Top belongs to the category Jersey Top and is part of the collection Jersey Top. The product has the article number 3013BK_black=01b by Maximila, and is available in the following colours: BLACK, and is made from these materials Lyocell 100%. We despatch your order within 3 working days, so you can expect delivery within 5 working days. We accept payments from credit cards and Paypal.